Let me begin by saying: I’m stressed. The holidays are a stressful time of year for me, juggling family obligations, gift buying, and social gatherings, but to make matters worse, I’m expecting a marriage proposal from my boyfriend any day now and the anxiety is killing me. We’ve been together for three years, and everyone is always asking us when we’re getting married. I’m tired of telling them “I don’t know.” I’m ready. I think he is. And I’ve dropped MANY hints that he should do it over the holidays—a joyful, celebratory time of year. But what if he hasn’t gotten the message? What if he’s not ready? What if I’m a ball of nerves for nothing? And what should I do with him—with us—when the holidays are over and there’s still no ring on my finger? Here’s a guaranteed method for getting that ring in 10 easy steps. Step 1: Stop expecting a marriage proposal. Stop anticipating a marriage proposal. Stop hoping for one, dreaming about one, imagining one, and fretting about not getting one. Step 2: Take a step back and think. You want to marry your boyfriend. But to get married, you must first be engaged—a sudden elopement is out of the question. But you also believe that you can’t do anything in order to get engaged. You must wait with exquisite patience for him to propose. You must pretend not to notice as he secretly does all of the work required to save up for, purchase, and present you with a perfect ring. This is a game. You want a ring. He, perhaps metaphorically, has a ring. But you cannot ask for the ring. You cannot expect the ring. You cannot be angry when you two go out for a romantic dinner and he does not produce the ring. The ring must be offered of his own free will. If you let him know how much you want the ring, your desire for the ring will make the ring disappear. You must be quiet and polite and kind and passive and unassuming. You must sit with your hands folded in your lap. Because if you say, “I want to get married,” that will ruin it. Then he isn’t giving you the ring because it’s what he wants to do—he’s doing it because you told him to do it. And then, for the rest of your life, you won’t know for sure if he really loves you. And you will have lost the game. The only way to win this game is to be silent and perfect and wait and then, when he does propose, you will have won. You will have won the game of rings. I hate the game of rings. I think it’s archaic nonsense, mostly because I played the game for many years and lost. I lost hard. The loss was translated into the end of a relationship. But I had lost before the relationship was over. I lost every time I had one too many beers and started openly asking my then-boyfriend, “Do you think about getting married?” He would half-answer, because there were many issues at hand that were very good reasons for us not to get married. But in his half-answers I felt sharp, hot shame. I wasn’t going to be chosen. He wasn’t going to pick me. I wasn’t worthy of the ring. Step 3: Don’t answer questions. The game of rings is perpetuated by the group of people most tortured by it: young women. We, especially around this time of year, post pictures of rings and “I said yes!” and “We’re getting married!” and happiness and tears over finally, finally, finally being chosen. We turn the act of picking a lifelong partner into a contest—who’s up next? Is it you? It must be you, I can tell. We also perpetuate this game through seemingly gentle inquiries, “When are the two of you getting married?” I was tortured by these questions because, back when I was playing the game, I knew that I had no way of answering. It was up to him, it was all up to him, and all I could do was hope and twist and wait. Step 4: Move forward. It’s January 2nd. The holidays are officially over. You wanted to say something on New Years Day but you didn’t. You decided to use the last reserve of strength in your body to hold back just in case today, today, today, the last technical holiday day, was in fact the day. But it wasn’t. And now it is January 2nd and he has not proposed and all you can feel is roiling black shame and anger in your gut. He didn’t do it. You waited so patiently, you were such a good girl, but he didn’t. So now you go to him, but you can’t talk about this measuredly, you can’t bring up this topic without all of your roiling black shame anger spilling out of your mouth. You are so angry, you were so good, why did he do this to you, people are going to ask, they’re all going to ask, and they’re all going to know that he doesn’t want to marry you. That he didn’t pick you. And then you’re going to pick a big, long, screaming, unending fight. Because you lost the game of rings and he had no idea that he was even playing. What if you weren’t playing the game of rings in hopes of a perfect diamond ring proposal payoff? What if you just asked the man you love what he actually wants? Would that make your eventual engagement any less special? Any less meaningful? Would it have any impact on the dozens of years you spend together? Step 6: Kill your idealized notion of romance to save your sanity. Having a conversation about getting married isn’t romantic, but it is practical. The truth is, he couldn’t surprise you with an engagement ring at this point if he wanted to. You’re more than ready to get engaged to him. My husband and I started talking about getting married one night while I was washing the dishes. I told him that I always wanted a surprise engagement with a ring and everything. He said that the idea of buying me a ring without my input didn’t feel right. He thought it would be nice to just have a conversation, decide to get married, and then go buy a ring. I hated that idea. But then we were in New Mexico, at a wedding, and there were mountains and the sunset and the lush grounds of the wedding venue. We were hugging and I was so happy to be there with him and without thinking about it at all I looked at him and said, “We should get married.” And he closed his eyes and reeled because, you know what, getting proposed to is an amazing experience even if you are a dude, and then he opened his eyes and said, “Yes,” and I can’t remember the next few hours because our happiness was so immense and expansive that it obliterated time. Years later, I was feeling self-pitying and tipsy after a night out and I did sit next to my husband and cry because I had never been proposed to. I am embarrassed to confess this truth, but I must. I had been taught that all women of worth are one day proposed to, and I had not been. I cried because no one had ever picked me, not in the way that women are told they’re supposed to be picked. Years later, I’m at Northwestern hospital, a million weeks pregnant. I’m in a hospital gown in a hospital bed and my husband is with me, sitting on the edge of my bed. We’re alone, waiting for the nurses to gather the supplies they will need to persuade my body to go into labor. My husband asked me to hand him my wedding ring, which I had taken to wearing on a chain around my neck because pregnant fingers are so, so fat. And then he scoots closer to me on the bed, holds the ring in front of me, and asks me to marry him. Because I wanted to be proposed to, to be chosen, picked, lifted up above all others. And though I can try to reason my way out of that need, tease out the cause of it, realize how culturally-informed and unexamined it may be, it was what I wanted. I cried with happiness. I, of course, said yes. Step 7: If you insist on playing the game of rings, then accept the terms of the game of rings. If you stick to the script where he does the picking and you sit by, helpless and hoping, then commit. Sit down and wait. Maybe this self-created purgatory will be worth it when he proposes on Christmas morning. Maybe you will wait, unfulfilled, until January 2nd and you will then break up with him for not conforming to your expectations. Your current state of powerless anxiety is one that you are imposing upon yourself. Step 8: Know what you want. Why do you want to get engaged? 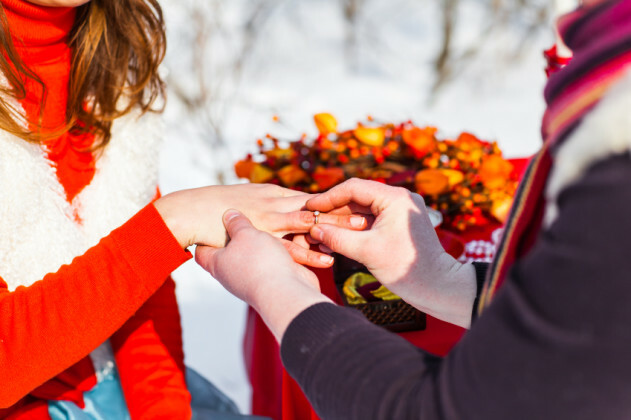 What do you think will change when you get engaged? Do you crave a life together with this man and you cannot wait for it to start, or are you bored and restless and desperate for the tangible bump in social status that accompanies a diamond ring? This man may propose to you. Or he may not. It does not seem so now, but his proposal does not ultimately matter in the long-term scheme of your life. His proposal is not a doorway into a new world. An engagement is exciting, wedding planning is exciting, a wedding is exciting, but on the other side of that excitement is your life, just as it is now, day flowing into day, a ring on your finger but the excitement behind you. The ring is ultimately a portal into the mundane—do you want the mundane with him? Do you understand that as an engaged, and then married, woman your life will be very much the same? You will have new problems, of course, problems you can’t even imagine at this moment. You will sit in your home and daydream about the time when you were so young and hungry and excited. You will long for the time when things weren’t decided. This is the cruel joke of the world: You never appreciate the wonder of the unknown until you can’t get it back. Step 9: Know that your desire to be picked, to be elevated, to be purely, fully loved, cannot be given to you by another person. No matter how elaborate or well-timed the engagement, the work of self-love will always fall back to you. Step 10: Put a ring on yourself.